Don't forget to mark your calendar for the Love My Library linkup next Wednesday May 12! I hate spiders. I know you're supposed to hide these types of irrational fears from your children, but I still squeal like a schoolgirl whenever I see one scurry across my path. E has naturally picked up on this phobia and decided to share it. So when I saw this beautiful book in the library, I thought it might be good therapy for the both of us. Written in present tense and second person, the book makes wonderful use of "you" to draw you into the world it creates. You see a little yellow spider and as you observe her you are pulled into her world: a creeping ant, an oozing snail, and a careless hiker that tears down your tiny spider's web. As the sky grows dark you have to leave the little spider to reweave her web as you fall asleep and weave dreams of your own. The language in this book is poetry and a joy to read aloud: "Yellow Spider glows like the evening star, gleaming over the sea besides the crescent moon." The illustrations are just as gentle and quiet with soft muted colors and dreamy micro landscapes. It's almost pretty enough to make me change my mind about spiders... almost. After reading the story we decided to try our hand at this beautiful Beaded Spiderweb I found on Family Fun. The Family Fun website has detailed instructions on how to create this spiderweb, so I won't go into all the steps here. It basically involves wrapping jewelry wire around 3 bamboo skewers and threading with beads. It's not a difficult craft, but it is time consuming. I was afraid E might get bored, but she was a trooper threading all those beads (I handled wrapping the wire). The finished project turned out just as good as I had hoped. I think the spider is particularly cute... if one could ever call a spider cute! What a cool craft. My girls always love the beading ones. Once again, fabulous linking the book and the activity. I will have to do this one over the summer. This book sounds wonderful. I will have to look for it. The web is so pretty. That is the most gorgeous web I've ever seen. What a great stART project! I love this web and the spider is definitely cute. I'm putting this on our list of things to do. I share your arachnophobia too, but both the book and the craft are gorgeous. I'll have to look into this book. Great project. It came out as a real piece of art. Really impressive! Thank you for linking up to stART this week. 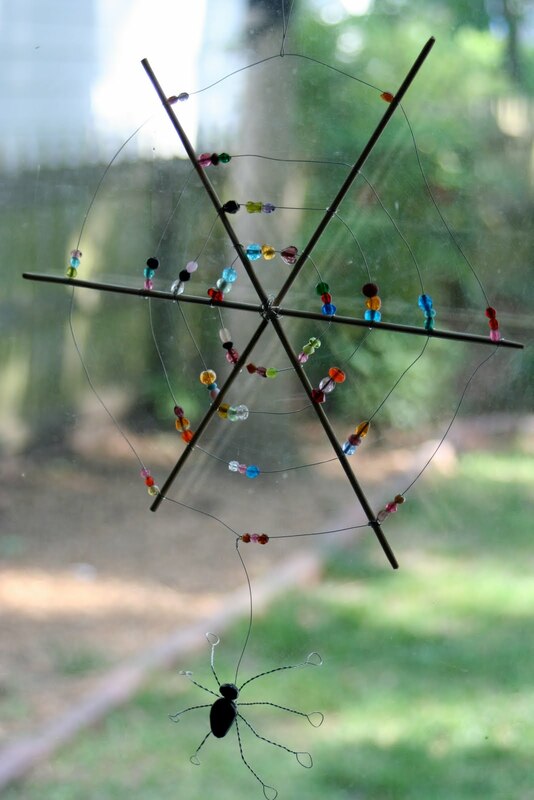 What a beautiful project and great fine motor work. I haven't read this book before. We'll have to look for it at the library!